Businesses continue to gradually adopt a hardware-as-a-service model for everything from printers to networking equipment as they look to reduce the burden on IT staffs to maintain equipment and let them instead spend more time on projects that are more strategic for their companies, according to a report released this week by IT industry marketplace Spiceworks. The report, titled the 2019 State of Hardware-as-a-Service, found that 48% of businesses currently lease one or more types of hardware, with 24% using the HaaS model — where the system is owned, managed and supported by an MSP or other third-party company — for at least one of the devices. The other 24% manage all of their leased equipment in-house, according to the report. The report’s authors noted that the “as-a-service” model has been embraced by enterprises for a number of years, from software-as-a-service (SaaS) for applications access online to infrastructure-as-a-service (IaaS) for companies leveraging cloud-based computing environment from providers like Amazon Web Services (AWS), Microsoft Azure and Google Cloud Platform. For those leasing hardware — which can range from data center equipment like servers and networking gear to in-house devices like printers, desktop and laptop PCs, desktop phones and smartphones — the top option had been leasing from a hardware manufacturer a la a car lease, with support coming through MSPs. According to Peter Tsai, senior technology analyst at Spiceworks, there are a number of reasons companies will adopt the HaaS model. The report, which included surveying 1,115 IT buyers in North America and Europe, said there will continue to be a gradual transition from the on-premises leasing model to HaaS, with 6% planning to adopt the model within two years. That echoes what Zeus Kerravala, principal analyst with ZK Research, has heard in talking with enterprise executives. Among those using HaaS, 71% of survey respondents said the model reduces the time and resources required by their IT staffs, while almost half also said it has improved everything from troubleshooting to setting up and maintaining the devices. Almost 40% reported a lower cost of ownership and other reduced expenses. However, there is resistance. 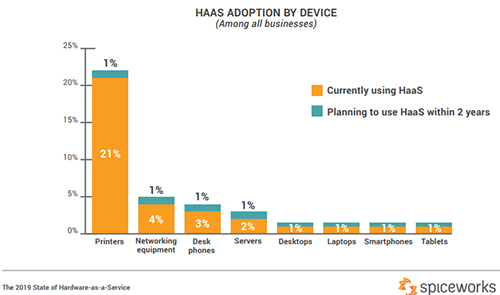 Fifty-six percent of businesses that haven’t adopted HaaS said they have the IT resources to manage their devices in-house and 42% said they were reluctant to give up control of the hardware. Thirty-four percent said they doubted the model was cost effective and 26% questioned the benefits.